Helmets would be required by law for all Albertans using any equipment that moves at significant velocity—regardless of age—in an ideal world, contends Don Voaklander, director of the Injury Prevention Centre in the University of Alberta's School of Public Health. "Currently, only kids under 18 are required to wear helmets when riding a bicycle in Edmonton," he said. "However, I often see kids at skateboarding park, or whipping by on scooters or rollerblades, not wearing helmets. When you're going any velocity, often on cement, and you fall off, there is always risk for traumatic brain injury." Summer activities including cycling, horseback riding, rollerblading, skateboarding and using non-motorized scooters between 2011 and 2014 resulted in a total of 59,726 visits to Alberta emergency rooms for head injuries, of which 3,575 were traumatic brain injuries, according to IPC data. "Wearing a helmet may not prevent a concussion, but some of the forces absorbed should reduce the severity and it will also reduce the severity of other head injuries," said Voaklander. "Roughly, helmet use will reduce mortality by 30 to 50 per cent." It's time to put to rest the pervasive myths that may stop kids and even adults from protecting their skulls with helmets, he added. Myth #1. I only need to wear a helmet on a bicycle. Though minors in Edmonton are only legally required to wear a helmet on bicycles, Voaklander said the same should apply for skateboarding, rollerblading, using a scooter and horseback riding. "Wearing a helmet should be promoted for all activities, and a good culture of helmet safety would help ensure use even for unplanned activities," he added. Myth #2. Helmets are sweaty and uncomfortable. "Most helmets are designed to be aerodynamic and lightweight, with proper ventilation," noted Voaklander. "Helmets have sizes and measurements so it's a good idea to try it on in the store," he said, adding that you need to make sure it doesn't wobble from side to side, tilt front to back or move when you shake your head in any direction. Myth #3. Helmets promote riskier play. Voaklander said that the "risk compensation" theory—if you make a kids wear a helmet they will be prone to play more dangerously—has no hard science behind it. "That's like saying wearing a seatbelt in a car makes you drive more recklessly." Myth #4. Helmets will make my child timid. "There is a movement toward more active play, which is rooted in the theory that some boo-boos early in life might prepare them for later life," said Voaklander. "Any purported benefit of active play does not outweigh the proven brain injury risks that may result from not wearing a helmet." Myth #5. My kid's not going to wear it anyway. It's true that peer pressure can lead some kids to put their helmets on their handlebars rather than their heads, said Voaklander, but he contends that the sooner you start kids wearing helmets, the less they are likely to succumb to peer pressure. "My three kids have been wearing helmets since they were mobile, and they've told me they can't straddle a bike without a helmet because they feel naked." By far one of the best ways to ensure lifelong helmet use is to show your kids by wearing one yourself, added Voaklander. 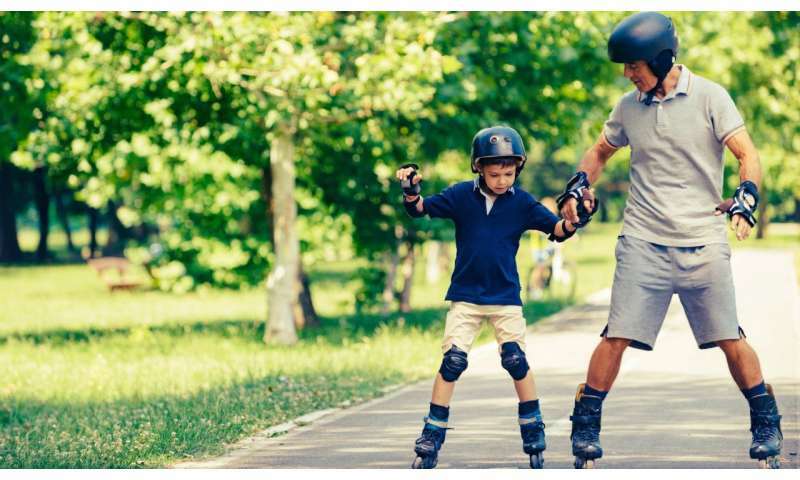 "Good role modelling by always wearing a helmet normalizes the behaviour and protects everyone from severe head injuries without limiting the freedoms summer has to offer."